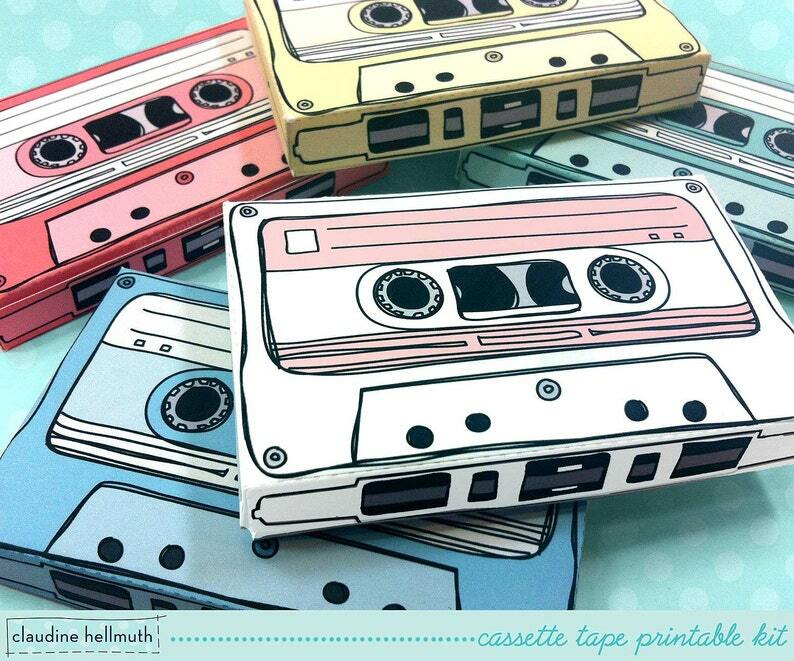 Easy to make Cassette Tape gift card holders & party favor boxes in FIVE colors. Actual size of a real cassette tape and illustrated on all sides for a fun, retro look. Fits wrapped candies, mini candy bars, gift cards, business cards, and other small goodies! Comes with a removable gift card tray that fits inside! No Waiting! As soon as your payment is confirmed you will see a "download" button on your Etsy Purchases and Receipt page. You will also receive an email with a link to download your files directly from Etsy. Questions about how to download or access your files? Etsy has a super helpful tutorial right here: http://www.etsy.com/ca/help/article/3949. Cassette Tapes - 4" w, 1/4"h, 2.5"d - very close to a real cassette tape size! Bought this for my 3rd grader to give out for Valentines Day. I thought this was a super simple yet adorable little favor to give. I filled it with skittles and starburst (the mini sizes) and his classmates absolutely loved it! It was so easy to print, cut, and assemble. Thank you! Great product! Easy and thorough instructions. Such a clever and fun idea! I followed your instructions and it was so easy to cut out and glue together! Very easy to make and turned out really awesome. Wished there were more colors or have the ability to change some color schemes but it turned out very nice. Please pay via PayPal or use your credit card with Etsy direct payment! Because my place of business is in Washington DC - residents of the District of Columbia will be charged 5.75% sales tax. In the event there is something wrong with one of the files, or you have ANY problem at all -- email me and I will work with you to you to make it all better! I truly want you to be 100% happy with your purchase! Once files have been downloaded, I cannot offer a refund. But your happiness and enjoyment of my kits is of highest importance to me. I won't be able to sleep at night unless I know you are enjoying your kits. So please let me know if you have any trouble and I will make it right for you! Please use these files to fill your home, celebrations and events with joy and whimsy! Print and make as many as you would like for your own personal (non business) use. Make a few for yourself! And don't forget to make some to give as gifts to your friends and family! All of my designs & illustrations are registered, copyrighted and protected under United States and International copyright law. This means that they can not be manufactured, distributed, altered, edited, copied, sold, shared or used commercially in any way without my written permission. Selling of my files or the finished printed items for any purpose (this includes creating items spoonflower, zazzle, cafe press etc.) is strictly prohibited. Delight your customers with original boxes for your sweet treats! Imagine an original bespoke cupcake or candy box that looks like a mini version of your bakery, cupcake shop or food truck! I can create a completely custom design for you or modify one of my existing designs. Professional printing and die-cutting also available. Just send me an Etsy convo or email! Just send me an Etsy convo or email!